Available in 90mm aerofoil profile shutter blades. 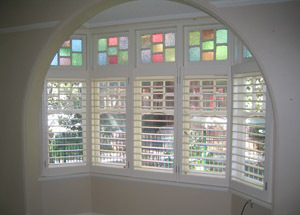 Hinged, sliding, bi-fold or concertina plantation shutter systems. Unique concealed mechanism to maximise views (no centre tilt rod or metal side control). 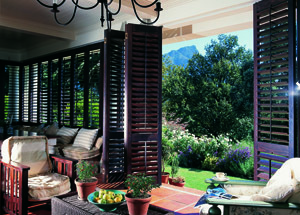 It uses a combination of engineered aluminium rack and nylon gears which are cleverly concealed within the shutter. The device avoids the problem of control stick failure due to wear and the problem of split blades caused by nailed rear joining systems – a system commonly used by our competitors. With other companies, the nail or screw is commonly screwed into the thinnest part of the aerofoil blade, which is its weakest point and can cause breakage. Can be painted to any colour. 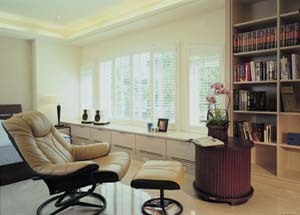 At the moment white is the most popular colour. There is ‘white out of the can’ or a tinted white. Or colour tinted to your own sample. As well they can also be finished with clear lacquered on the cedar. 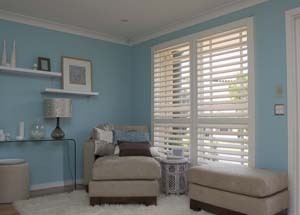 Shutters can be configured with a split opening for a combination of privacy and shading at a point determined by yourself to suit your environment. 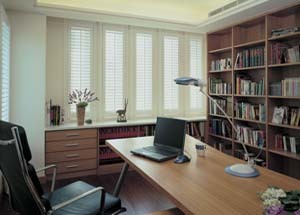 Our plantation shutters are made from Western Red Cedar – no inferior or finger jointed timbers or synthetic materials are used. insect damage make it the ideal choice for any surface exposed to sun, heat, cold or rain. EXCLUSIVE BLADE SIZE: Aero 103mm. In 2010 we introduced this new blade as we felt that there was an opening for a blade between 90mm & 115mm. The 115mm blade tended to look too large and bulky in the home situation. Whereas the 103mm was a good size to optimise the view and light without using the 90mm. The 103mm is particularly good when there is a panoramic view including those of the harbour, city, sea or countryside but still offering complete control of shading and privacy.